„I expect you would like me to find out whether there are any mines there,“ he said quietly. I cannot remember what I said. But I remember how I felt. I think I just mentioned that I thought that would be quite useful. He replied, with immense dignity, „Very well, sir.“ Then he went off to prepare for the possible loss of his ship and people the best way he could. I shall remember him as one of the bravest men I ever met. This was Victoria Cross material but, strangely, only if it went wrong. I personally felt awful not to have had the guts to be honest with him and wondered what the devil he was going to tell his ship´s company about their task tonight and about my pitiful performance, which, for a sea-going admiral to one of his commanders, beggared description. Woodward was at the time preparing the amphibious assault on East Falkland; he was working on a very tight schedule dictated both by the coming of the Antarctic winter as the foreseeable limits to his ships´ operational readiness. D-Day had been scheduled for not later than 25 May. After some procrastination and conflicts amongst the commanding officers San Carlos Water on the jagged western coast of East Falkland had been selected as landing site. All the ships involved would therefore have to navigate the Falkland Sound, poorly charted as all the waters around the Falklands. And it was imperative to make sure beforehand that those waters were free of mines. As no minesweepers were with the fleet at the time and none should be available in time, Woodward had to send one of his ships through the suspicious waters, acting effectively as a mine dog. It had to be a warship that was able to defend itself and had to be of sufficient size to activate mines, yet he had to chose a unit that was expendable. Hence he chose one of his Type 21 frigates. The type 21 had been designed in the 1960ies after a heated public discussion on the perceived inefficiency of the Royal navy´s design board. It had been argued that private yards would be able to produce better and more innovative ships for much less money. 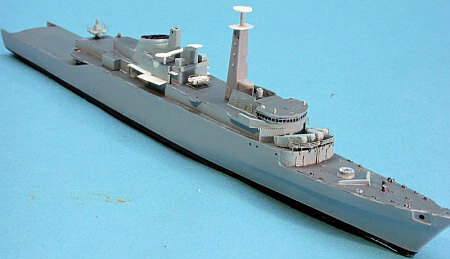 The figures in question were 5 million GBP for the Leander class ships versus 3.5 million GBP for the Type 21. In the end, a mixture of open and hidden interests resulted in an order for a full eight ships of the class, giving the yards of Yarrow and Vosper Thornycroft complete freedom of design. The resulting ships were handsome and well-liked by their officers. In keeping with previous ships built for export, they had a higher standard of accomodation for the officers and and a lower for the ratings. As a novelty, they were constructed with superstructures of marinised aluminum to reduce topweight, a practice heavily lobbied for by the yards and initially refused by the navy´s designers, yet one at the time in widespread use by the US navy. 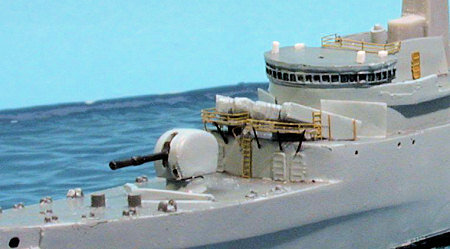 The ships were comparatively weakly armed with one 4.5 in gun, two triple lightweight torpedo tubes, a single Seacat AA missile launcher and two 20 mm Oerlikons. Their electronics suite was very basic, as the entire design which has been later on termed „low-end“. Nonetheless costs exploded and ended up at a staggering 14 million GBP for the lead ship, HMS Amazon. During the class´s service life only few modernizations were implemented, the major of them being the addition of four MM. 38 Exocet sea-skimming anti-ship missiles. Several of the ships had their torpedo tubes removed. When plans were made to improve frigates for patrols of the GIUK (Greenland-Iceland-UK-Gap) against Soviet missile subs and surface ships, the Type 21was found lacking the potential for retrofitting the required equipment, mainly a better sonar. The earlier Leander class proved to have more potential, was successfully modernized and served longer in the RN than the Type 21. Moreover, the ships proved to be too structurally weak for the demanding all-year service in northern waters due to their composite construction of steel hull and aluminum superstructures. Event though the RN was spared the catastrophic fires the USN experienced on the similarly constructed USS Worden and Belknap, use of aluminum superstructures in later designs was discontinued. In the Falklands, the type performed admirably despite its limitations. The six vessels deployed rendered good services as escorts, in shore bombardments and in a number of assorted duties. The rough weather proved to be too much for their hulls, and some of them had their hulls reinforced in emergency repairs. The surviving ships´ hulls had to be reinforced later. Two of the class, Ardent and Antelope, were lost off the Falklands, yet to bomb hits that would have destroyed any modern unarmored warship of similar size, so this was no fault of the design. The class´ limited stability and reduced hull lives caused their early withdrawal and sale to Pakistan in 1993/4, where they still serve today, although with new equipment and weaponry. On the whole, the class proved a disappointment in performance and little value for money. Back to Alacrity and the night of 10 May, 1982. It was a dark and misty night, and navigating the Falkland Sound proved to be a challenge in itself, even without mines and enemy action. Nonetheless the frigate made good progress. With as many of her crew as possible stationed above the waterline, she made her way through the sound. She had fired star-shells over the Argentine base at Fox Bay and was halfway through the Sound when she detected a vessel. Illumination by star-shell failed due to the low cloud base, but being convinced that it could only be an Argentine ship, Alacrity´s gun fired HE rounds. Several hits were scored on what proved to be the Argentine naval transport Isla de los Estados and her deckload of aviation fuel, which exploded and destroyed the ship. The British assumed that the enormous fireball had been observed by the Argentines and therefore proceeded along the Sound to leave rescue operations to them. 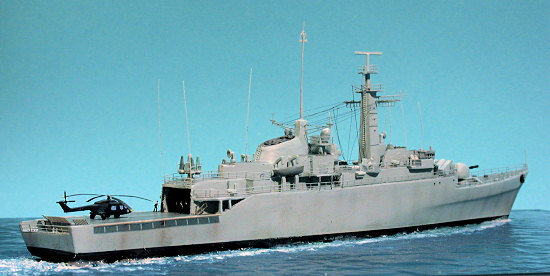 As in many other instances during the conflict, the Argentine guards did not realize what happened and only after the vessel failed to respond to radio calls the next day, a search was started. The two survivors were picked up only on the 13th. Alacrity proceeded along the Sound and made the required sweeps to ensure the passage was free. It must have been a great relief for anyone on board when she left the enclosed waters, undetected by any of the numerous Argentine observors, and met her sister ship Arrow off Cape Dolphin. Unbeknownst to the British, they were then targeted by the most modern Argentine submarine, the German-built Type 209 ARA San Luis. Luckily for the British, the submarine experienced technical problems with its fire control computer. Of the two wire-guided SST-4 torpedoes fired, one did not leave its tube and the second was foiled by Arrow´s towed decoy. San Luis returned to port for repairs yet could not be restored to operational readiness before the war ended. And so ended Alacrity´s night mission. She served on well during the campaign, was not damaged by bombs yet had to be relieved after her gun barrel was worn out. Even though Cdr. Craig offered to „stay here and fight until the bloody barrel drops off“ he was ordered to return home on 7 June. I grew up modelingwise on a steady diet of Airfix kits, and being somewhat of an Anglophile still enjoy the subjects and try my hands on those vintage kits. At the end of last year´s annual 1:700 scale ship modeler´s meeting at Laupheim near Ulm, the forthcoming meeting´s motto was discussed and agreed upon to be „25 Years Falklands“. A year should be reasonably enough time to complete a model or two, isn´t it? Well – basically it is, but then there´s the same effect that makes you run out of time for buying xmas presents – even though xmas doesn´t happen totally unexpected and also just once a year. I started looking for online and written sources and collected a number of books, even wrote a lecture to be delivered on the subject. 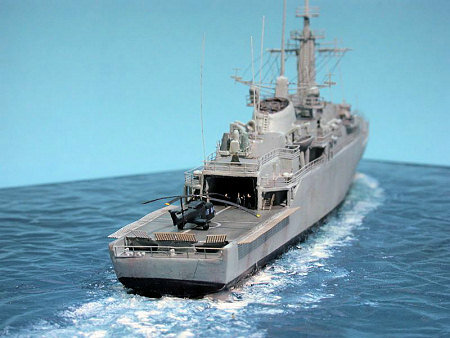 I also bought the Airfix Falklands Warships Set, plus the Airfix HMS Fearless, ordered the appropriate WEM PE parts plus resin Seacat launchers, Exocets, Lynx and Wessex helos – and considered myself admirably prepared. Well, only to a degree. There were other urgent kits to be built and after all some semblance of a professional and private life going on, so it was only at the very end of August, 2007, that I started on two kits. I had fostered the excuse of not having read enough to decide upon which ship to model in which situation, and during our summer vacation had spent considerable time re-reading and re-writing until I had arrived upon a decision. That soon crumbled to dust (and I even forgot what it was) upon buying and racing through the memoirs of Admiral Woodward, in 1982 Commander of the Carrier Battle Group. His description of HMS Alacrity´s night action just hooked me – I now knew how I would present my Type 21 – steaming in calm yet dangerous waters at night. And I must add I was also most impressed by the open and unflattering description of Admiral Woodward´s thoughts and actions, a most remarkable book! Well, you can rely on Airfix kits in that they don´t change much and age well. Accuracy is limited, though the outline is mostly right. 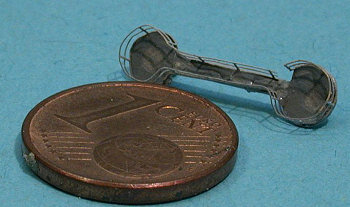 Parts fit well generally, yet you won´t find any crispiness or sharpness in their molds. 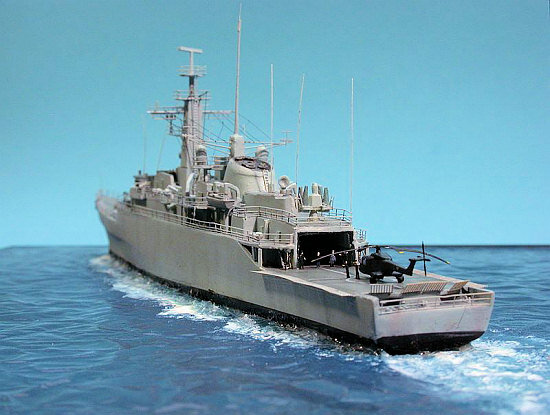 In this case, the Falklands warship set kit contained a small extra sprue with four Exocet launchers – the only improvement towards the issue I had happily built in 1973 or thereabouts. I ran through my available images and tried identifying what had to be corrected. Now I am not overly concerned about a kit´s dimensions or accuracy as long as it looks convincing to me, yet there were some things that had to be tackled. Some were identifiable from looking at the kit, others from consulting the images, and a few popped up only after studying images modeling friends of mine had taken of the very nice and large model of HMS Active at the Fleet Air Arm Museum, Yeovilton. Early on, I mused a lot about how to make the water base. 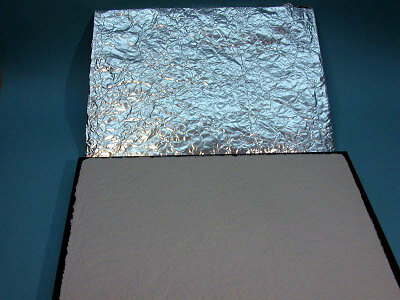 After some trials with silicone caulking, I had given clear acrylic gel a try yet didn´t feel actually comfortable yet. When I found a how-to on the plaster method on IPMS Stockholm´s website, a decided to try my hand at that, too. Hence, the hull and deck was assembled, waterlined with a diamond disc, and I started the plaster test. Using a conveniently sized picture frame, I first disassembled it and then wrapped the glass with finely crumpled household aluminum foil. The glass was then clamped to the front side of the plastic frame and I was able to pour plaster from the backside into the frame. After curing, I removed the clamps and the wrapped glass and found a very nice wave pattern, although on a very flat sea. Well, that was OK for the Falkland Sound on an overcast and misty night. After trimming what little overpour there was, I could place the model on the base and start carving the still rather soft plaster with a modeling knife to receive the hull. Quite messy, yet effective. I also used the knife to carve the water around the ship disturbed by the hull and of course, the wake. After I was satisfied with the effect, I left the plaster to fully cure. Painting was done with various cheap paints from the hardware supermarket, mostly white, blue and green, with a bit dark sea blue acrylic misted over the undisturbed part of the seascape. I tried to keep the entire effect subtle and a bit subdued. After the paint was dry, I added several layers of high gloss clear coat from a big rattle can, also bought at the hardware supermarket, exuding the rich and cozy odors of lacquer-based paint. That made for a nice finish. Early on, I also „researched“ the paint scheme. My research culminated in an inquiry directed at most knowlegeable and helpful John Snyder of WEM. John redirected the inquiry to none other than Peter Hall, WEM´s PE designing genius, who happens to have served as an aircraft mechanic aboard HMS Hermes during the Falklands campaign. Peter answered that early on in the conflict, all hull numbers and other markings on the ships were painted out in light grey, as well as the black areas on masts and funnels. The ship´s boats were also overpainted. The black boot topping was retained. Peter couldn´t remember what actual paint was used but believes that it was not the usual paint used on the hulls, yet rather a lighter paint giving a more matte finish, possibly a primer. 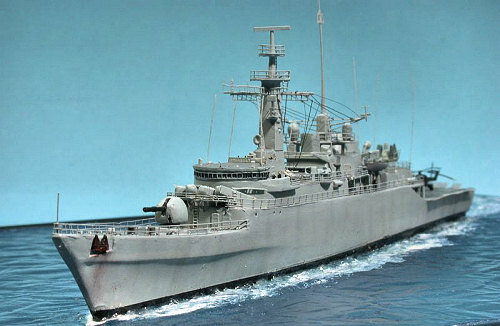 Only the Type 42 destroyers received recognition aids as the Argentine also operated this type. Hence, the British ships received a broad black vertical stripe along the funnel down to the waterline, readily visible in the images of the stricken HMS Sheffield. Moreover, a Union Jack was painted on top of the wheel house. I obtained the necessary paints and proceeded with the build. In the end, I used acrylic paints as I start feeling more comfortable with them and find touchups easier, plus the very short drying time is a nice bonus. I used IJN Maizuru Grey by JPS Modell for the decks and a home made mix based on RAL 7035 Lichtgrau for the weatherworks. I mixed it a bit lighter than the Colourcoats I used as a reference to compensate for the scale effect. Most of the parts were primed with an enamel-based primer before adding the acrylics but not all. 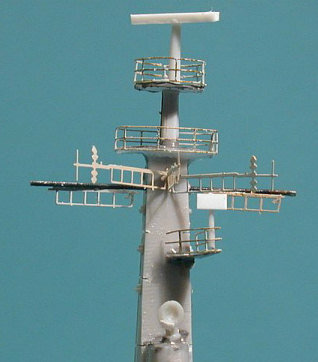 I would have preferred making the superstructure in several subassemblies yet didn´t manage to, so I was left with the to me very tedious task of painting lots of demarcations between decks and weatherworks, not all of which ended up as crisp as they are in my daydreams. 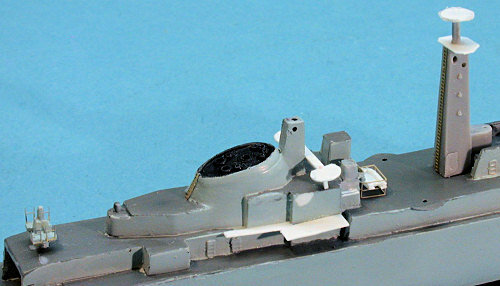 Prior to painting, I had drilled open the scuttles and added watertight doors from the excellent generic WEM set # 625 "Ultimate" Post-War Royal Navy Set 2. I had also bought #624 "Ultimate" Post-War Royal Navy Set 1which contains the specific parts for the Airfix kits. Sadly I found that this set contains no specific parts for the Type 21, so I had to mix and match, liberate and cannibalize parts originally meant for other kits I didn´t plan to build in the immediate future. In the end, I mounted the model to its base using clear acrylic gel. After drying, I drybrushed the surrounds of the vessel using white artist´s oil paint and called it quits. The „night“ images were taken using a small LED flashlight as sole source of light. Building time was from 26 August to 23 September, 2007. A nice and rewarding project, over the course of which I did learn a few new techniques and improved on earlier ones. I ended up with a reasonably nice model of a ship I have always found visually very appealing, depicted during a daring mission. - Steve Power of modelwarships.com, who has done it all before and told me how he did – many thanks!